USC marked many major milestones under Sample’s leadership. The university recruited some of the most academically talented freshman classes in the country, more than doubled sponsored research to $430 million a year, and completed two comprehensive, university-wide strategic planning processes designed to take USC to new levels of academic excellence. It also mounted the most successful fundraising campaign, raising $2.85 billion and becoming the only university to receive four separate nine-figure gifts in one campaign: $112.5 million from Alfred E. Mann to establish the Alfred E. Mann Institute for Biomedical Engineering, $120 million from Ambassador Walter Annenberg to create the Annenberg Center for Communication, $110 million from the W. M. Keck Foundation for the Keck School of Medicine of USC, and a second gift of $100 million from the Annenberg Foundation to support the USC Annenberg School for Communication and Journalism. Important new facilities that opened under Sample’s watch included USC University Hospital, Thomas and Dorothy Leavey Library, Jane Hoffman Popovich and J. Kristoffer Popovich Hall, the International Residential College at Parkside, Zilkha Neurogenetic Institute, USC Viterbi School of Engineering’s Ronald Tutor Hall and USC Norris Comprehensive Cancer Center expansion project, to name a few. What is more, USC was named “College of the Year 2000” by Time magazine and the Princeton Review for the university’s extensive community-service programs. Read Steven Sample’s extended biography, including selected speeches and articles. Los Angeles is rocked by riots, but the USC campus emerges unscathed. Ambassador Walter H. Annenberg gives $120 million to create the Annenberg Center for Communication – at the time the largest cash gift in the history of higher education. USC chemistry professor George Olah, director of the Loker Hydrocarbon Research Institute, wins the Nobel Prize in Chemistry. The USC Board of Trustees unanimously approves a strategic plan outlining four priorities – undergraduate education, interdisciplinary research and teaching, programs building on the resources of Los Angeles and Southern California, and internationalization – for building on the university’s competitive advantages. USC’s Good Neighbors Campaign is instituted, channeling faculty/staff giving into support of USC-neighborhood partnerships. The USC Leventhal School of Accounting is named in recognition of a $15 million gift from Elaine and Kenneth Leventhal. The first annual USC President’s Distinguished Lecture is held, with guest speaker Norman H. Schwarzkopf (M.S. ’64). 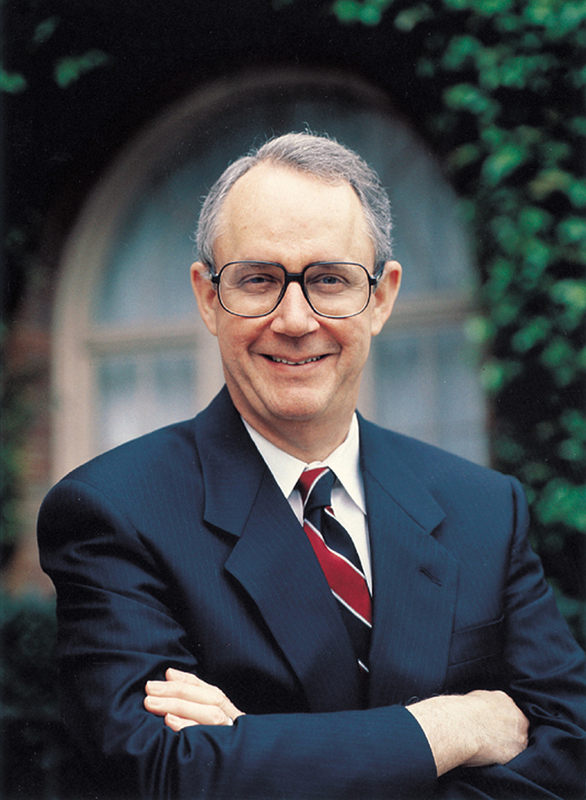 Gordon S. Marshall’s $35 million gift to name the USC Marshall School of Business is announced. The USC Wrigley Institute for Environmental Studies opens on Catalina Island. Widney Alumni House, the oldest university building, is moved to the site of USC’s new main entrance. The USC Board of Trustees approves an update of the strategic plan, identifying four critical pathways of opportunity: communications, the life sciences, the arts, and the urban paradigm. Alfred Mann gives $112.5 million to create the Mann Institute for Biomedical Engineering, and Barbara and Roger Rossier give $20 million to name the USC Rossier School of Education. USC’s Institute for the Study of the Jewish Role in American Life (later renamed the Casden Institute) is created. USC’s Schools of Public Administration and Urban Planning merge to become the USC School of Policy, Planning, and Development, now known as the USC Sol Price School of Public Policy. Flora L. Thornton gives $25 million to name the USC Thornton School of Music, and the Keck Foundation gives $100 million to name the Keck School of Medicine of USC. The first Los Angeles Times-USC Health Fair takes place on the University Park campus. Time magazine and The Princeton Review name USC “College of the Year 2000” in recognition of its outstanding community service. The Newsweek/Kaplan How to Get into College Guide names USC one of nine “hot schools” for 2001/2002. USC is one of 16 universities named as a “leadership institution” by the Association of American Colleges and Universities. USC’s Robert Zemeckis Center for Digital Arts opens as the country’s first and only fully digital filmmaking training facility. The Annenberg Foundation makes a $100 million gift to the USC Annenberg School for Communication and Journalism to support faculty positions, a broadcast news initiative, and new graduate and postdoctoral scholarships. With the close of the “Building on Excellence” campaign, USC sets a new record in higher education by conducting the most successful fundraising effort ever, raising $2.85 billion in nine years. The U.S. Department of Homeland Security selects USC as its first Homeland Security Center of Excellence. USC is awarded a second Engineering Research Center from the National Science Foundation – the Center for Biomimetic MicroElectronic Systems. The Princeton Review selects USC as one of 81 “Colleges with a Conscience” based on its outstanding record of community involvement. The USC Federal Relations office opens in Washington, D.C., to provide policymakers with access to topical research and expert faculty for testimony and briefings. The university begins celebrating its 125th anniversary. The university renames its school of fine arts the USC Roski School of Fine Arts in recognition of a $23 million pledge from longtime Los Angeles arts patrons Gayle Garner Roski and Edward P. Roski Jr. U.S. News and World Report features USC and the university’s Joint Educational Project in its list of “Top College Academic Programs in Service Learning.” The Lucasfilm Foundation donates $175 million to the university to support the USC School of Cinematic Arts. The Keck School of Medicine of USC dramatically expands its research space with the dedication of the 10-story Harlyne J. Norris Cancer Research Tower on the Health Sciences campus. The university receives a $60 million gift from the estate of Jane Anne Nohl for the USC Division of Hematology and the USC Norris Comprehensive Cancer Center. Alumnus Ronald Tutor pledges $30 million to create a new campus center. The USC Good Neighbors Campaign tops $1 million in voluntary contributions from faculty and staff to support neighborhood programs. Alumna Verna B. Dauterive pledges $25 million to USC, marking the largest gift yet made by an African American to a U.S. institution of higher learning. USC acquires USC University Hospital and USC Norris Cancer Hospital from Tenet Healthcare Corp. for $287.8 million. An independent study shows that USC generates $4.9 billion annually in economic activity in the Los Angeles region and beyond. Alumnus and trustee Herman Ostrow donates $35 million to endow and name the Ostrow School of Dentistry of USC.